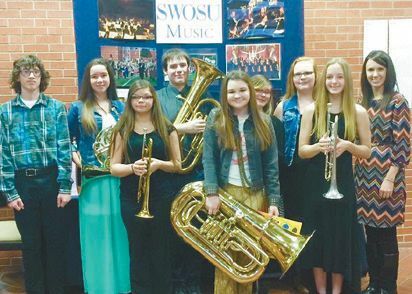 On February 18th Cheyenne Band members traveled to SWOSU for the District Solo and Ensemble Contest. The brass ensemble of Olivia Lucas, Ashton Cockrell, Taylor Choate, Amber Little, Caden Blume, and Sydney Bottom played “In the Hall of the Mountain King” and received an EXCELLENT rating. The woodwind duet of Jamie Beasterfeld and Brandon Blackketter played “Spring from The Four Seasong” and received a SUPERIOR rating. Way to go bear band members!